But Now He Has Been Found! Jonathan and I had the rare pleasure today of personally bringing a child and his father home again. 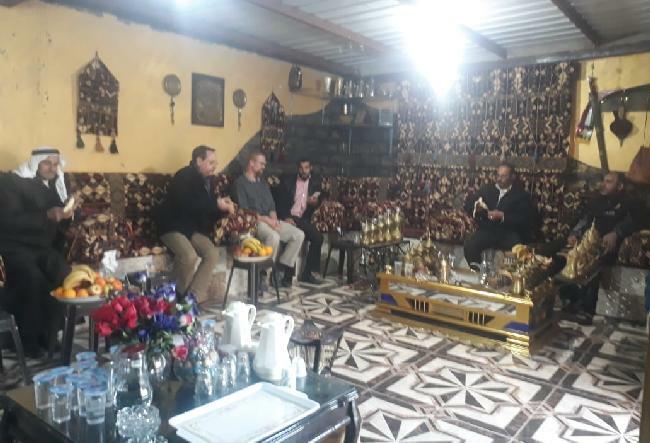 The hospitality was overwhelming, those of us from the west have a lot to learn from these honest and hospitable people. As we enjoyed the lavish meal prepared for us, I was brought back to the story of the prodigal son. I could imagine that joyful meal with such clarity in this setting. 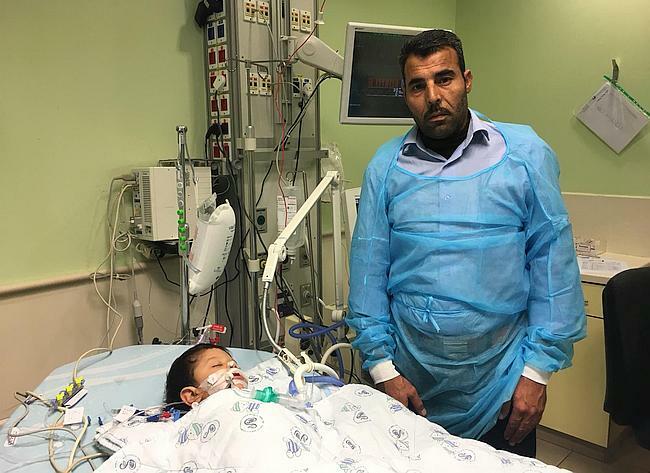 Mohammad was “lost,” – there was no way Mohammad could receive this life-saving surgery in Jordan or Syria. They had tried and failed to go to Scandinavia and their only other option was Israel, an enemy country that they could never enter on their own. Today, God fulfilled His promise to Avraham made so many years ago, “In you all the nations of the earth will be blessed.” And he used the global Body of Messiah to do it. None of this would have been possible without the sacrificial giving of so much time, money, and prayers by all of you. It was an honor to be a witness to the returning of this “prodigal son.” And may we be a witness to many more to come. 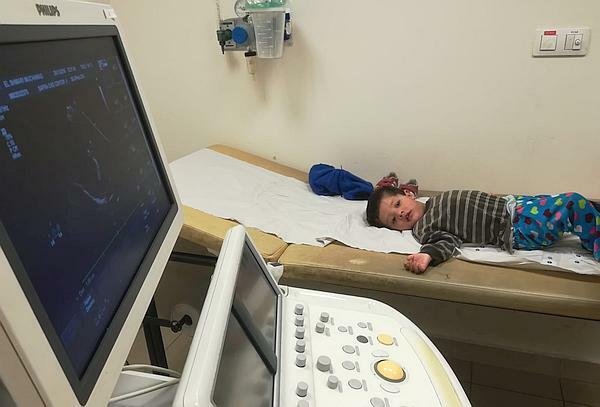 Little Mohammed went to have his heart checked today. Although he didn’t enjoy the actual echocardiogram, he was an entertaining bundle of joy either side of his appointment. This tiny little man is a charmer with his big smile and on cue dance moves. Doctors were happy to find that he still doesn’t have any fluid buildup, and we are now in the process of weaning him off his medication. 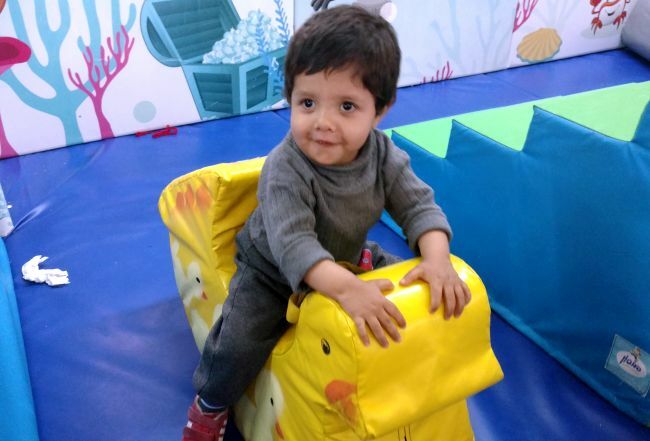 Mohammed will have another check-up next week to make sure he is fluid-free without the help of medication. If he is, then he will be able to head home. Praise God for this good report! 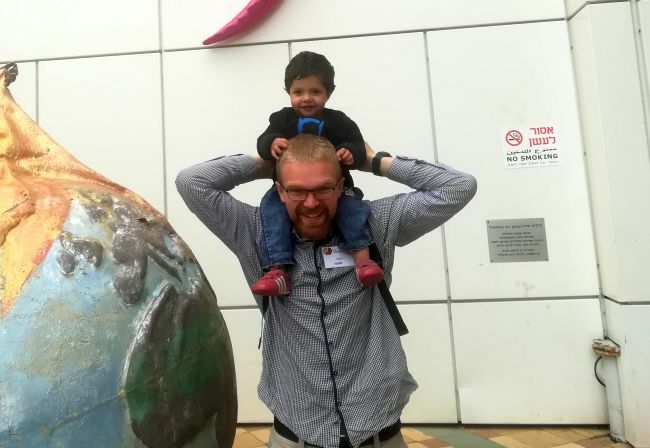 Today we went to the hospital with little Mohammed and his dad. 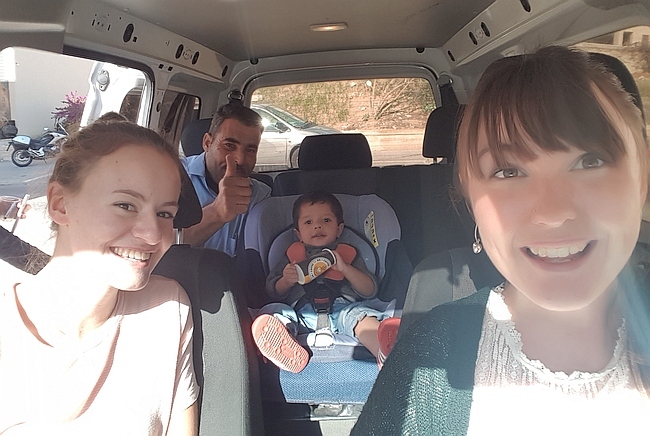 He enjoyed his trip very much in the car, but when we arrived at the hospital he cried so much when they were doing each of the procedures – an echo, ECG, and checking oxygen saturation. We tried to distract him, but he would not stop crying. 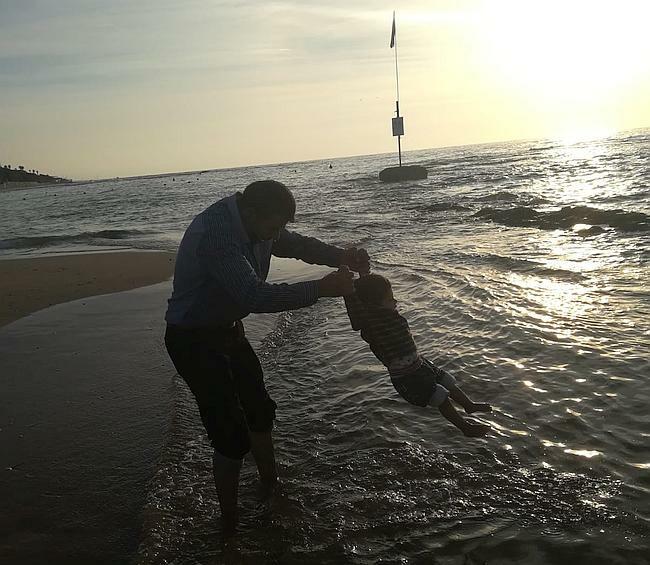 The only one who managed to calm him down was his loving father. Finally, the doctor called us and told us that his echo showed that he did not have any liquid and that everything was very good. The doctor seemed to be very happy, so he reduced the doses of the medications and Mohammed will have his next echo on Sunday. Depending on his result, this may be his last echo and they can go home. 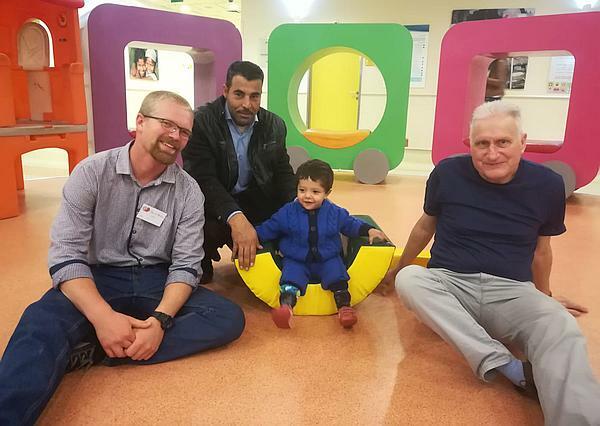 The doctor explained everything in Arabic to Mohammed’s father, so he was very happy to know that they will soon be at home. 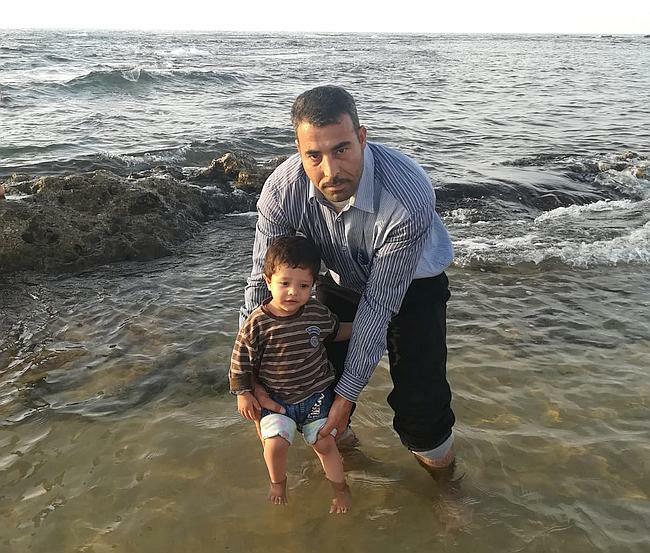 Please continue to pray for Mohammed and his father, and his beautiful family who need our prayers. Both Mohammed and his father were in high spirits as Mohammed had an appointment for another echo today. The results of the echo showed that there was no liquid in his lungs! Mohammed was very patient during the long waits to see the doctor. He enjoyed walking through the halls, and getting snacks from a trolley that was in the lobby. Overall it was a good day, and were able to get back to the house in time to say goodbye to little Gabriel before he left to go home. 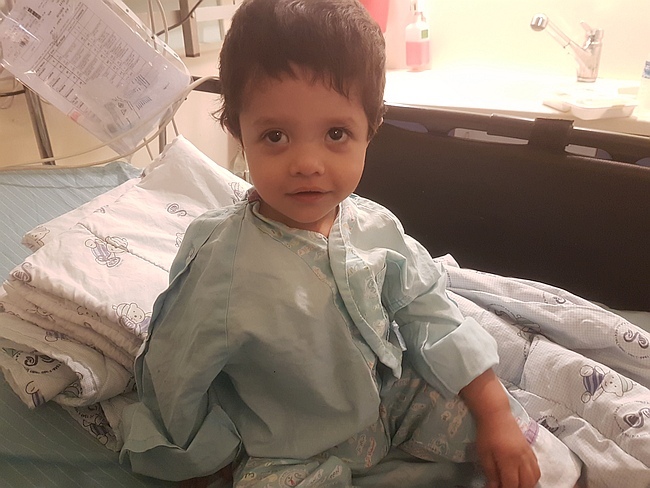 If it wasn’t for the Sheba pajamas and the surrounding setting of secondary ICU, it would be hard to guess that just four days ago Mohammed had his surgery! Praise God, He is so good and His timing is perfect. It was wonderful to visit Mohammed and his father today. 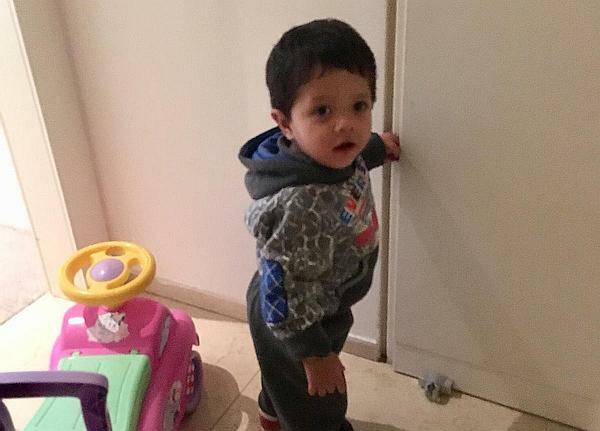 Mohammed was sat watching Arabic nursery rhymes on his father’s phone, smiling, laughing and interacting so nicely. We learned today that he will be discharged from hospital tomorrow. Give God all the glory for making a way for Mohammed. Please pray for him as he returns home tomorrow that he and his father may come to know and love their creator. Mohammed’s father excitedly ushered us into the room show us how Mohammed is awake and extubated. He described the surgery with a few gestures and was so pleased that it was successful. 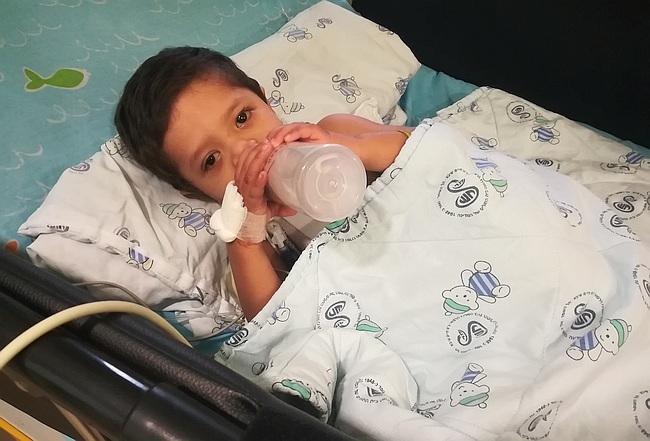 Mohammed also had been moved into the secondary ICU by the time we left the hospital today, the doctor was very pleased with his quick recovery. 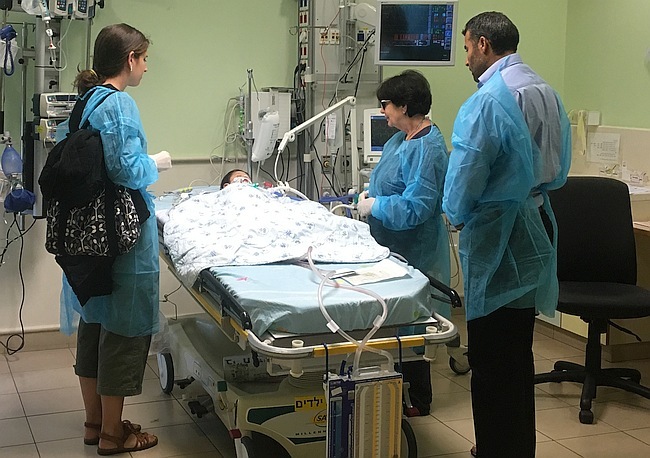 Please pray for his continued recovery, and we hope to see him home at Shevet soon. 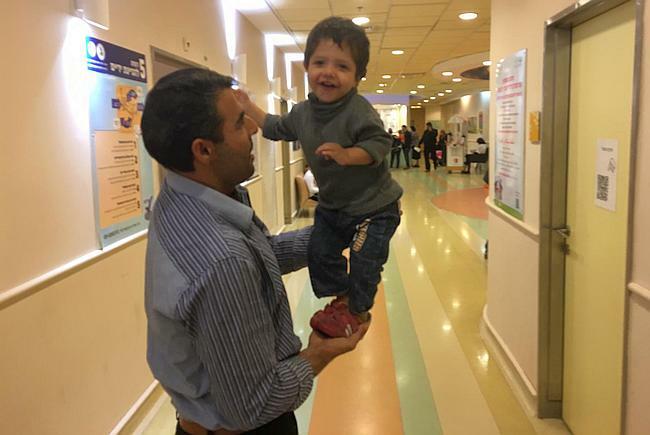 Little Mohammad finally received his lifesaving surgery to close the hole in his heart. Blood is now flowing properly through his veins to nourish and strengthen his body. 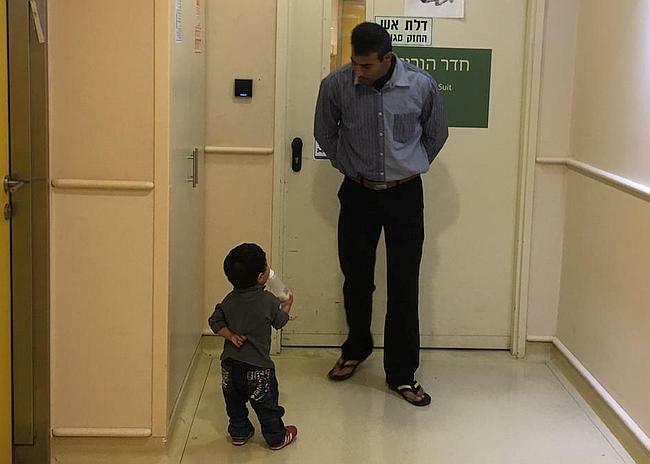 These pictures were taken just when Mohammed’s weary father was finally allowed in to see his son after surgery. So even though this was a traumatic day, his long healing process has now begun. We pray it will culminate in a healthy young boy who can grow up to be a blessing and accomplish much for the Kingdom. We found out today that Mohammed will have his surgery tomorrow. This is such great news which has come through much quicker than we had perhaps expected. 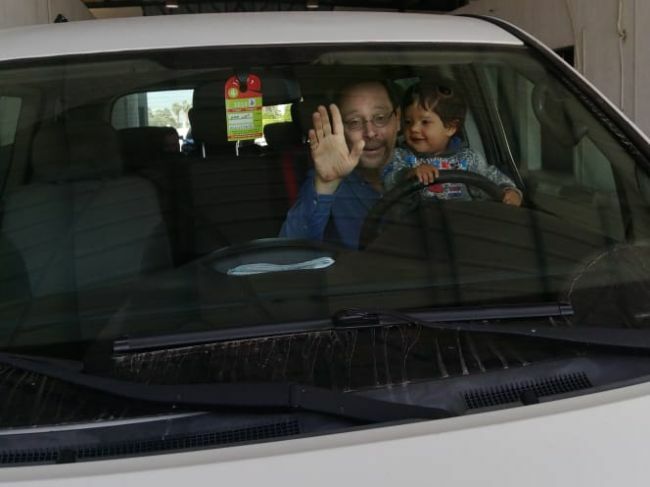 Mohammed has already become a very wonderful addition to our Shevet Community. He is so full of joy and laughter and the boy loves to dance! 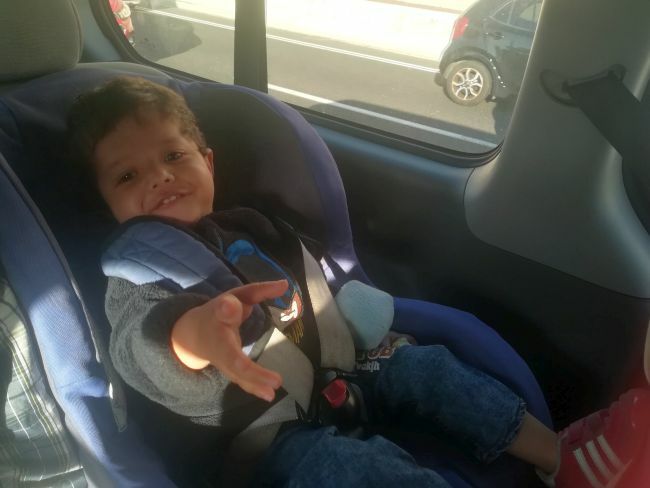 As we drove to hospital, Mohammed was clicking his fingers above his head in his car seat and smiling away. When we arrived at the hospital Mohammed went for chest x-ray before going to his bed in secondary ICU. The whole process was very smooth and quick and we are thankful to God for this. 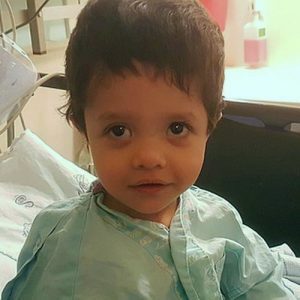 Mohammed will have his surgery early tomorrow morning. Please pray for him and the surgical team tomorrow. We can’t wait to have him back home with us soon. 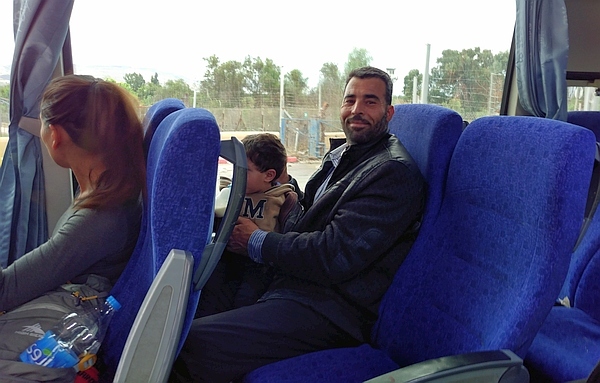 Mohammed and his father have been with us in Israel for nearly two days now. Mohammed seems to have been trying out his luck at making friends with Noor at the house, and he enjoyed the songs at Yara’s farewell party last night. 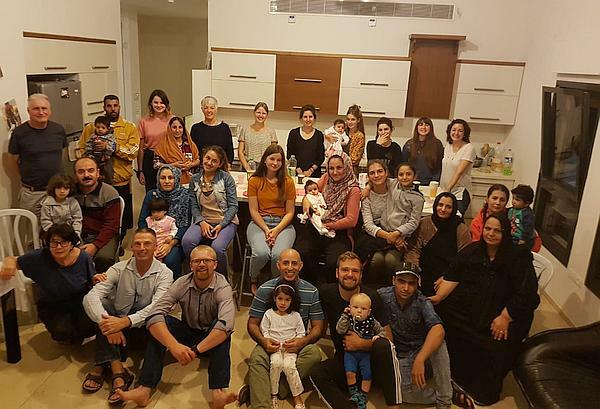 I met Mohammed and his family in their country of refuge during the summer time, and so it is really exciting to have him here at Shevet finally. Mohammed has also already won the heart of someone (else!) from England, who has committed to raising sponsorship for his surgery. 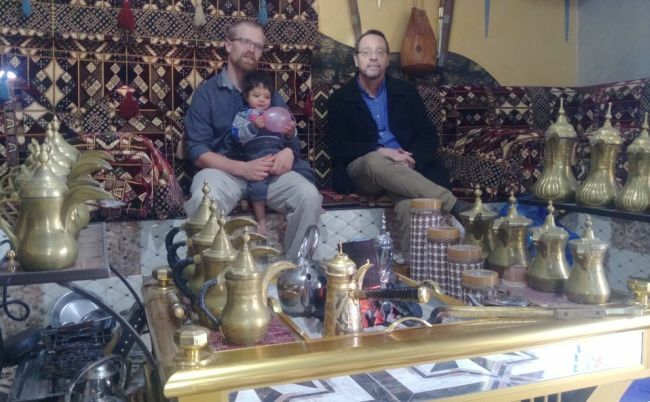 Steve (pictured above right) was able to be at Shevet over the weekend to meet Mohammed and his father, and also came to the appointment today. It was so encouraging to hear how many people in his community have got involved generously to help this little one, both from and outside of the church. So, this morning we all went to the hospital together for Mohammed’s appointment. 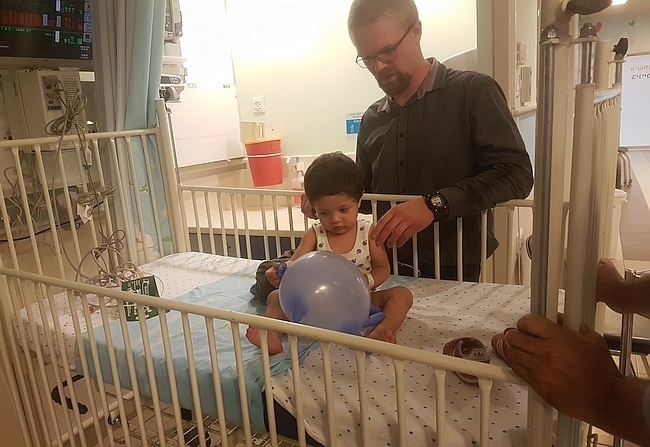 He is nearly two years old and found the dark room for the echocardiogram and sticky tabs for the ECG just a bit too much, and he really cried! The doctor then said that he would have to be scheduled for an echo under sedation as they were unable to make a good assessment this time. But as dad held him tightly and soothed him with a bottle of milk, Mohammed fell asleep, and so, praise God, the doctor was able to make another echo. 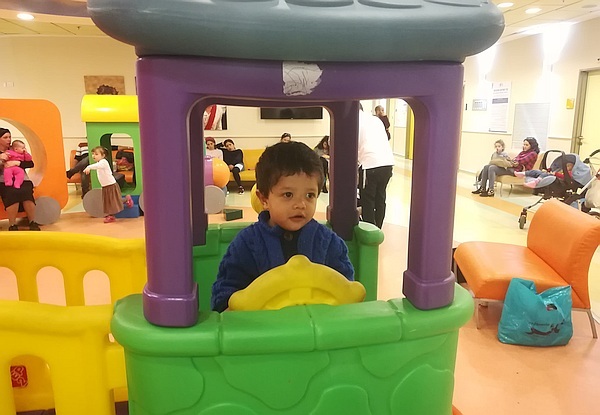 The results showed clearly the plan for surgery, and so we just need to wait for the hospital to call and say when it is going to be scheduled. 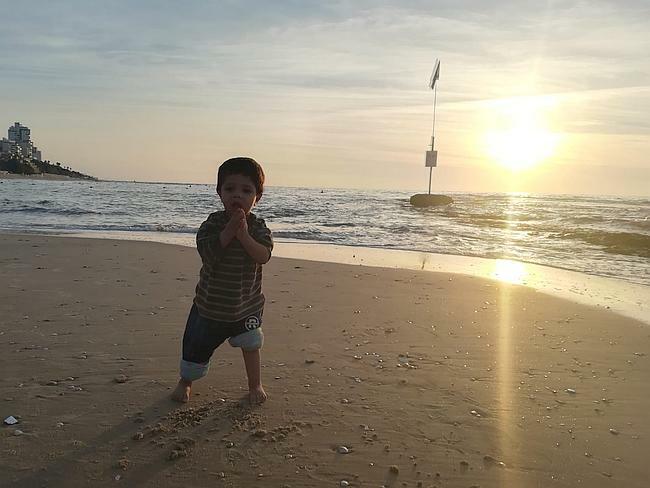 Please thank God for this lovely boy and his family, and we commit this time in Israel to our wise Father. It was significant because a joyful little boy will be able to grow up with a healed heart. It was significant because it helps bring our Muslim friends closer to the redemption story revealed to the world through the Jewish people. And it was significant because our generation will answer one day before the judgment seat of God for our silence about the slaughter of many innocent lambs among our Syrian neighbors. 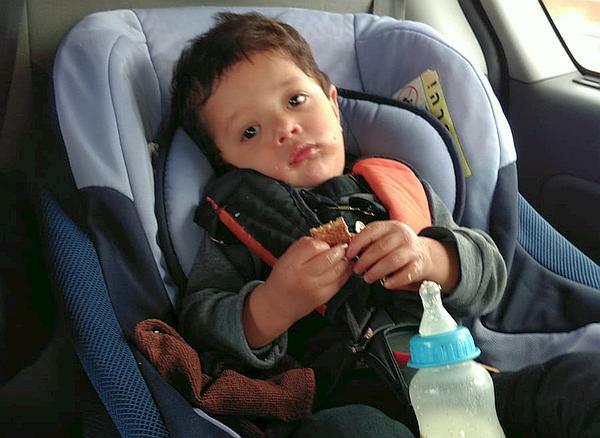 As of right now, Mohammed still needs $6250 toward surgery and related expenses.